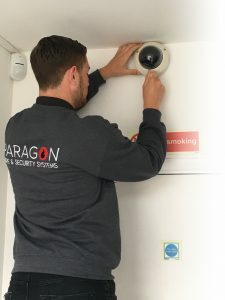 At Paragon Fire & Security, we can take care of all your CCTV maintenance to give you total peace of mind knowing that your security system will continue to perform well. Our maintenance programmes include inspection and testing for any deterioration, cleaning and quality assurance. View our detailed service breakdown. We can arrange a routine maintenance plan to ensure that any downtime you experience is scheduled and kept to a minimum. If any part of your CCTV system stops working at any time our experienced CCTV engineers can quickly service or replace equipment as necessary. Our CCTV servicing prices start from as little as £80 per visit dependant on the number of cameras. This service contract entitles you to one service visit per year and 24 hour call out service with a maximum emergency response time of 4 hours. We offer fixed price servicing with all our CCTV servicing contracts for a minimum period of TWO years from contract start date. All our CCTV system service contracts DO NOT have a tie in period or minimum term. Call us to discuss your CCTV maintenance needs on 01483 724484.